We are pleased to advise you about general property investment in Costa Rica and to help you to find the right spot for your project according to your individual needs. Our philosophy is to advise our customer and to find a property which best suits the Client's preferences rather then just sell any property. Our target is to have happy Clients on the long run who will choose us again and again in the future. After sales support with insurance, maintenance service or property management. Why Invest at the Pacific Coast? Costa Rica is a very investor friendly country not only for Costa Ricans but also for investors from abroad. Costa Rica has topped twice the ranking of the 'Happy Planet Index', an annual study carried out by New Economics Foundation. Costa Rica has been preserved as a calm and safe natural paradise. Costa Rica is one of the most stable countries in Latin America. It is known for its well skilled people thanks to an excellent nationwide education system; this is the reason why multinational companies have opened e.g. their call centers or other branch offices in Costa Rica. 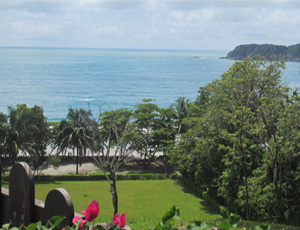 After the expansion of the second international airport of Costa Rica in Liberia in 2012, the Liberia Pacific Coast Area has become an ideal alternative to San Jose to set up such Latin American offices or call centers. Tourism has been exploited to a certain level in the area, however, the construction of the new airport terminal in Liberia enables easy access from abroad to this tourism destination. The beach is just 20 min. from the airport and Liberia town can be reached with 15 min. This matter of fact is attractive for investors from many countries and fast growth is expected in the region. The Liberia Pacific Coast Area's favorable, warm climate, has attracted many senior citizens from the United States and European countries to live at least a part of the year in this region. It is said that the climate also helps patients with respiratory and other health problems to recover from their diseases. Health services in Guanacaste have improved significantly over the last years with new hospitals such as CIMA and Clínica San Rafael Arcángel in Liberia. The country overall counts with a good health system and highly skilled medical professionals. Foreigners have the same rights to own property in Costa Rica as locals and receive the same legal property title from the Government as Costa Ricans do. We will be glad to personally explain you more about ownership in Costa Rica and the purchase process in general.